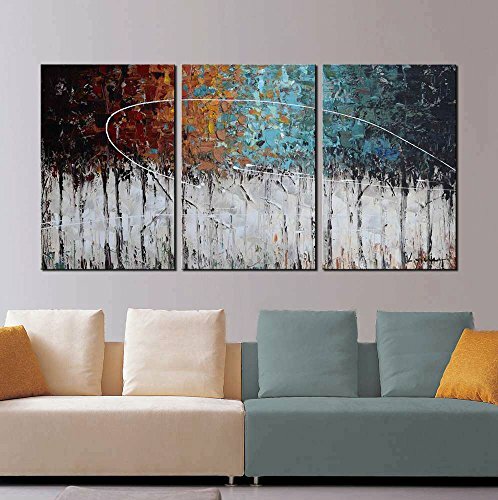 This beautiful painting is 100% hand-painted oil painting provided by ARTLAND. This picture is created by painting knife, the Italian Venetian school master Titianfirstly used this technique which is a new painting technique that was developed by him in his old age,through using a palette knife with finger to paint color, it formed his unique painting style, the characteristic of this styleis painting decisively, bold colors, bright warmand lively. The color of thispainting is quite beautiful, primary colors and somegradually-changed colors, through multi-layer covering, the layer of the whole forest is very rich, in the middle ofthe screen the sky blue and the orange have a strong contrast with the dark color, which let the viewers couldn't help to focus on the center point, it makes the picture more sense of depth. The authordepicted the whole screen juicy and wet, it feels like a dense vapor pressing to the viewers, but it brings the viewers a bright cheerful mood, through this painting it also intended to convey a positive and optimistic attitude. Artland: A perfect wall decoration for living room and bed room.A great gift idea for your relatives and friends. Return Policies:You can return our items purchased at Amazon for a full refund within 30 days of purchase.